It’s fair to say that Frank Plant didn’t get much of a go at Collingwood. 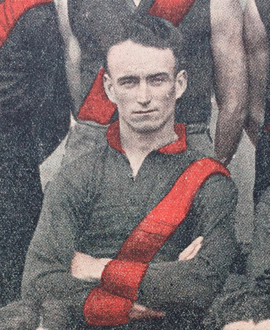 He came from Wonthaggi and, after a promising pre-season that saw him kick a brace of goals from centre half-forward in one intraclub game, was chosen for the opening round of the 1922 season. Named in a forward pocket against Richmond (fellow Wonthaggi recruit Ted Baker was in the other), Plant did well enough without setting the world on fire. But while Baker kept his spot and would go on to have a wonderful career, Plant was dropped the next week (George Tory lasted one more game before also being dropped, never to return). Plant doesn’t seem to have played with the seconds after that and was back playing in a premiership with Warragul by the end of that year. But Collingwood’s loss turned out to be the VFA’s gain. For Frank Plant ended up becoming a star with Coburg in the VFA, even winning the competition goalkicking one season. Frank Plant wasn’t really tall enough to hold down a key position, especially at VFL level. But in the VFA his clean hands, good kicking and wonderful reading of the play proved a deadly combination. He wasn’t a key forward, but what we might now call a ‘third tall’. He had actually been going to play with Benalla in 1925 – years after his brief sojourn with the Magpies – but changed his mind at the last minute and threw in his lot with the newly formed Coburg Juniors. The next year he started with the Coburg seniors. Plant played in three successive flags with Coburg and was a star in each. He topped 50 goals in each of his first four seasons, finishing in the top five VFA goalkickers every year and winning the award in 1928 with either 77 or 78 goals (records vary). He was on track for another big season in 1930, with 38 goals in 10 games, before injury cut short his season. He started 1931 with a bag of eight in the opening round but was forced into retirement by more injuries midway through the year. He had played 93 games with Coburg and kicked over 350 goals, and would later be inducted into the Coburg Hall of Fame. Richmond had tried to recruit him back to the VFL midway through 1929 but Coburg wouldn’t grant him a clearance, and Plant wouldn’t leave without one. So he stayed a Lion, not a Tiger, and the Magpies were spared the prospect of him coming back to haunt them in that year’s finals series. Obviously it’s hard to tell just how good a player might be from one solitary outing. But Collingwood’s selectors would surely have questioned their decision to jettison Frank Plant after just one game: his record with Coburg suggests he might have had something more to offer in the VFL than what he showed in his only taste.